F.A.U.S.T. -- Marie Curie Fellowship Blog of Bernhard Kainz: Project started!! So, we did it! I got the contract for the upcoming two years and can start to work on my own research project at Imperial College London. Thanks' to the European Commission (EC) the signed grant agreement arrived also in time. 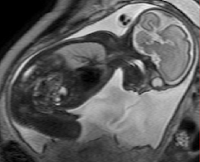 The image shows one slice from a 3D MRI volume scan of a pregnant women. This is one slice of one volume out of around 200 datasets that are available for F.A.U.S.T. I'm looking forward to attend the upcoming scan sessions to acquire even more datasets.